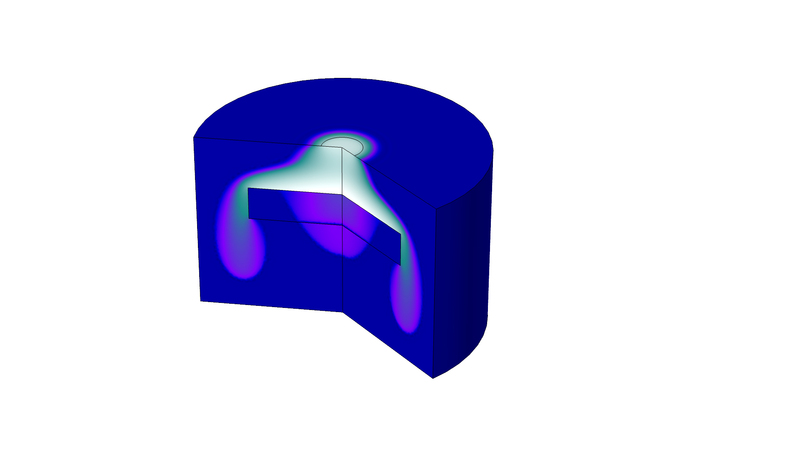 For users of the Subsurface Flow Module, COMSOL Multiphysics® version 5.4 includes new Phase Transport and Phase Transport in Porous Media interfaces, as well as a Multiphase Flow in Porous Media interface. Read more about these Subsurface Flow Module updates below. The new Phase Transport interface is used to simulate the transport of multiple immiscible phases in free flow. This interface solves for the averaged volume fractions of the phases in laminar or creeping flow, without tracking the interface between them. This is in contrast to the previously available Phase Field and Level Set methods, which track the interface including surface tension effects. The new Phase Transport interface is less computationally demanding than using the interface-tracking methods. The new Phase Transport in Porous Media interface is used to simulate the transport of multiple immiscible phases through a porous medium. The interface solves for the averaged volume fractions (saturation) of the phases. Microscopic interfacial effects are taken into account through capillary pressure functions. Both of the new Phase Transport and Phase Transport in Porous Media interfaces can be used in combination with single-phase and multiphase flow interfaces to simulate multiphase flow in free and porous media with an arbitrary number of phases. The new Multiphase Flow in Porous Media interface combines the functionality of the Darcy’s Law and Phase Transport in Porous Media interfaces. This multiphysics interface is intended to model flow and transport of multiple immiscible phases in a porous medium. 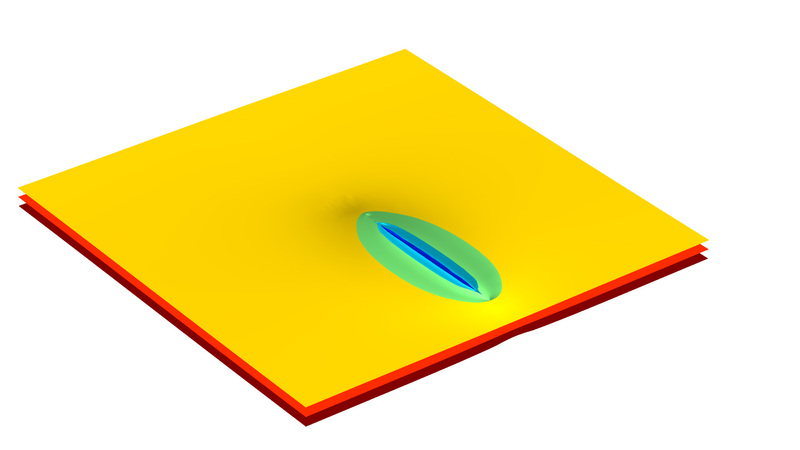 An animation of a phase penetrating a low permeable lens; that is, two-phase flow in a porous medium that contains a low permeable lens. The heavier phase infiltrates the porous medium from above. The low permeable lens is infiltrated only when a critical saturation is reached at the outside of the lens. 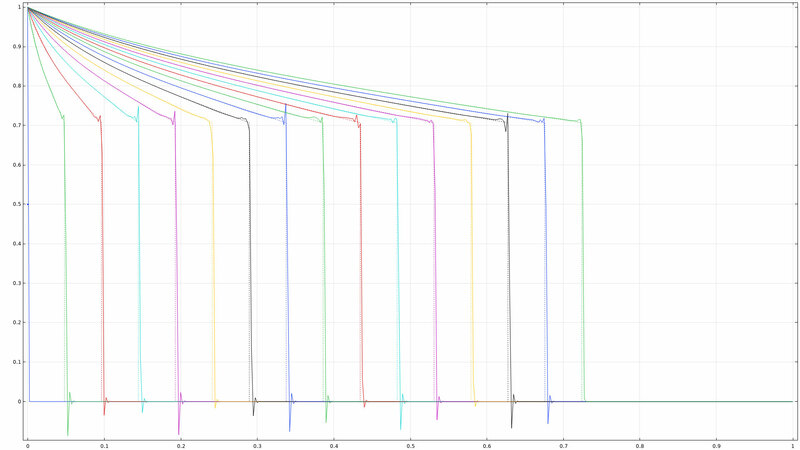 Saturation profiles shown at intervals of 20 seconds, compared to the analytical solution. A heavy phase infiltrates the porous medium from the top, going trough a low permeable lens. Pressure of the wetting phase around the injection well after 1500 days.